Are you tired of trying to find out Portals until “The End”? 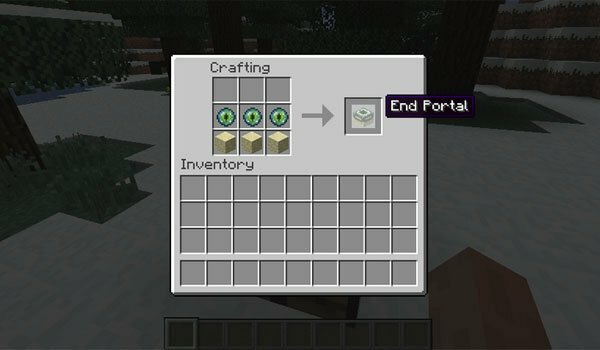 Craftable End Portal 1.7.2 and 1.6.4 is a simple mod that adds just a block and a recipe to the game. The recipe is similar of the one you use to craft a Minecraft bed, but, placeing at the bottom, three blocks of sandstone and over them three Eyes of Ender. Thus you get the “End Portal” with which you just need put in the ground to create the portal and jumpinside to travel to the dimension of “The End”, so easy and fast. How to install Craftable End Portal Mod for Minecraft 1.7.2 and 1.6.4? Now you can create a portal to “The End” without having to look for it in Minecraft!